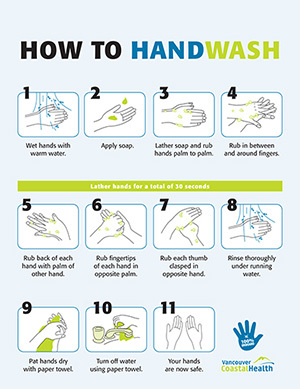 Hand washing is the best way to prevent the spread of infection. When you wash your hands, you wash away the germs that you may have picked up from people, surfaces or from animals. 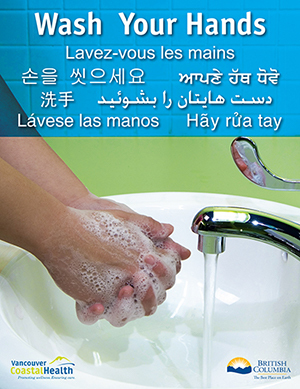 Teach children to wash their hands thoroughly and often so hand washing becomes a life-long healthy practice. These instructions are geared for child care centres and schools but include good tips for home too. There should be liquid soap, water and disposable paper towels available for hand washing. Use plain liquid soap to wash hands. Do not use antibacterial soaps or cleaners. These can lead to antibiotic resistance. When washing their hands with soap and water, children should wash for 20 seconds. Sing “Twinkle, Twinkle Little Star.” Then rinse well. Use disposable paper towels to dry hands and throw the towel into the garbage. “No Touch” garbage cans help reduce the spread of infection. When soap and water are not available, children should use an alcohol-based hand sanitizer. Alcohol-based hand sanitizers are safe for children to use. 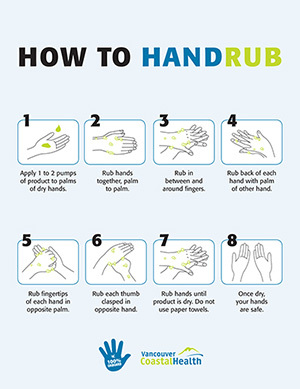 When cleaning their hands with alcohol-based hand sanitizer, children should use enough sanitizer to keep their hands wet for 15 - 30 seconds. Follow the directions on the bottle. When should children wash their hands? After handling animals or animal waste. When hands are visibly dirty or if there is diarrhea, soap and water works better than a hand sanitizer.